Tie together the parsley and thyme sprigs with kitchen twine. Heat a large wide saucepan or deep skillet over medium-low heat. Add the olive oil and shallots. Cook, stirring, for about 1 minute or until the shallots begin to soften. Add the garlic and cook another minute or so. Add the wine, cream, salt, and pepper. Stir well. Add the herb sprigs and bring the mixture to a boil. Add the mussels and cover the pan. Cook until the mussels have opened, about 5 minutes. Remove the pan from the heat and toss out any mussels that didn't open. Discard the herb sprigs. 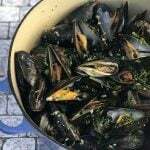 Pour the mussels and their liquid into a deep serving bowl and sprinkle with the chopped parsley. Serve immediately. If you can afford the carbs, serve the mussels with crusty bread to dip in the sauce. For a more luxurious sauce, replace the olive oil with unsalted butter. Place the butter in the pan and let it melt before adding the shallots. Note this will add more saturated fat to the dish.